My English grandmother gave me a book when I was 8 years old, it was “The Sinking of the Titanic and other great sea disasters,” by Logan Marshall.” It was the mystery of Titanic that got me interested. I began collecting everything I could. It was so unique, a period of time that will never live again. 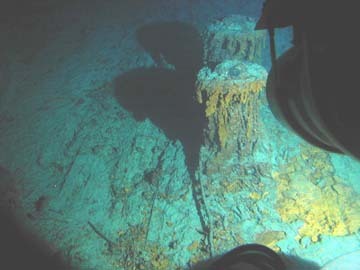 When Titanic was discovered, I had to see it. In 2000, my wife, Jill, saw a segment on Good Morning America in which passengers went down to visit the Titanic. She secretly set about getting me that same opportunity and on my 60th birthday, I got the surprise of my life. 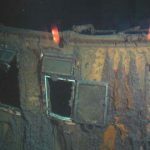 I was able to fullfill a lifelong dream of being one of the few to dive 2 1/2 miles down into the cold North Atlantic to visit the Titanic in its final resting place, and some 370 miles off the cost of Newfoundland. 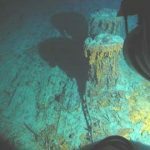 We have all seen pictures of the wreck but I can truly say that nothing compares to seeing it up close and personal, even though it was through a small glass port 7 inches thick… thick enough to withstand the tremendous pressures that exist at a depth of 12,500 ft.
My wife and I boarded the Russian research vessel, Akademik Keldysh in St. Johns, Newfoundland in July and steamed out to the site where the Titanic foundered some 89 years before. Jill was planning to go along only as an observer to give me moral support but, at my urging, finally relented and agreed to accompany me on the dive. 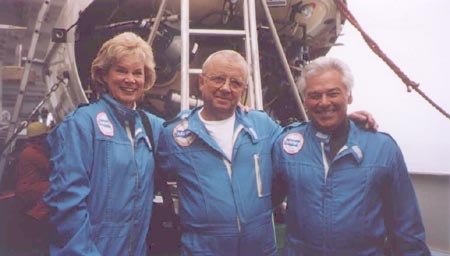 Dr. Anotoly Sagalevitch, the designer of the MIR deep dives submersibles, agreed to be our pilot on the dive, which further set my wife at ease for taking this great adventure. 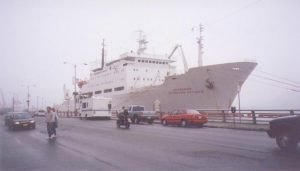 We arrived at the site on the afternoon of July 18, 2001 and immediately started our preparations for the dive. 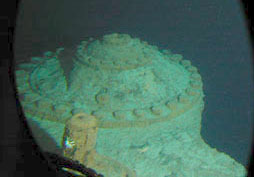 The Keldysh slowly steamed in a large triangular pattern in the area of the wreck site while dropping torpedo-like sonar transmitting transponders to the ocean floor some 2 1/2 miles below. 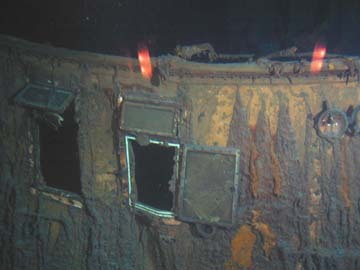 These transponders would be used by the MIRs to navigate the wreck as conventional electronic means of navigation are of no use at such great depths. As evening fell, the rolling seas we had felt on our trip out to the site changed to a strange calm. 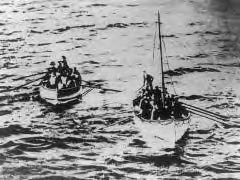 As I looked out on the black oily surface of the sea on that starless night, one could almost see and hear the cries of those 1523 poor souls who met their maker in the early morning hours of April 15, 1912, less than 100 yards from where I was standing. I must admit that the feelings I experienced at that moment were the most powerful of any experience on the entire trip including the dive itself. 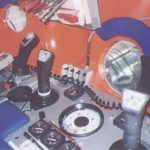 The 19th was spent orienting ourselves to the MIR submersible itself and what we would experience during the 11 1/2 hours that we would be inside the 6 foot diameter special steel chamber. We would be supplied with special coveralls made from a fire resistant fabric as fire is a major threat in the oxygen rich atmosphere inside the MIR. 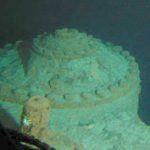 There are only five deep submersibles in the world capable of diving to the depth of the Titanic. 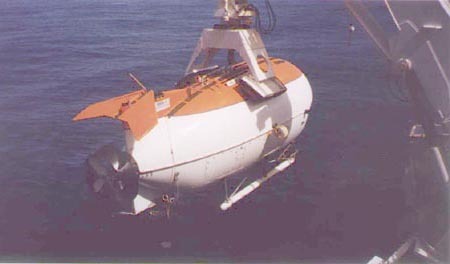 The U.S. has the Alvin, which is the submersible Dr. Bob Ballard used when he first discovered the Titanic in 1987. The Russians have the MIR I and MIR II (both carried aboard the Keldysh) and these were extensively used during the filming of John Cameron’s movie “Titanic”, the IMAX movie of the Titanic wreck, and for much of the salvage of Titanic artifacts that can be seen at major museums. The French have the Nautile and the Japanese have recently launched the Shinkai. Even with all of these, there have been fewer persons who have ventured to the depth of Titanic than those who have traveled to outer space. 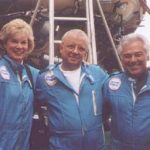 At about 8:30am on July 20th, Jill and I, along with Anatoly, boarded MIR I, the small hatch was quickly closed and we were lifted off the deck by a special crane and gently lowered into the sea beside the mother ship. A small team of Russian crew then sped up to the almost submerged MIR in a small inflatable boat, removed the cable from the deck crane and attached a tow line from a previously launched auxiliary vessel, which would be used to tow us away to a safe distance from the Keldysh before we began our dive. Although the sea had again started to churn up, we had the foresight to apply seasickness prevention patches behind our ears to prevent the bobbing action of the floating submersible from bring on “Mal de Mer” before the dive began. 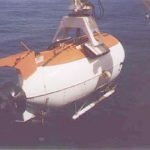 Within 30 minutes of our launch from the Keldysh, the tether was released from the towing vessel and Anatoly threw the switches to allow water to enter the submersible’s ballast tank and we began our slow 2 1/2 hour free fall to the ocean bottom. All traces of light quickly disappeared as our eyes strained through the small holes to catch a glimps of sea life as we descended. At 700 feet, it was absolutely black… or was it? All around the MIR, small luminescent creatures registered their presence as they were excited by the water turbulence as our submersible descended through them. And, as one gazed into the distance beyond, large but vague clouds of shimmering colored lights could be seen. It was a truly amazing sight and kept us well occupied during the decent phase of our journey. Finally, almost three hours after our launch, the line of the approaching ocean bottom could be seen on the sonar instrument display within the MIR I just above our viewing ports and gave a short burst of power to our vertial thrusters to slow our descent. Slowly, a gray-white moonscape began to appear. We had reached the bottom! Emerging from the shadows was a creature that looked as curious as I am sure we did. This white “thing” was about 4 feet long with enormous eyes and appeared to be a cross between a shark and an eel. Obviously attracted by our lights, it hung motionless except for stabilizing wiggles of its long tail and fins about five feet in front of our viewing ports. Satisfied that we posed no threat to its domain, it slowly retreated into the dark abyss. 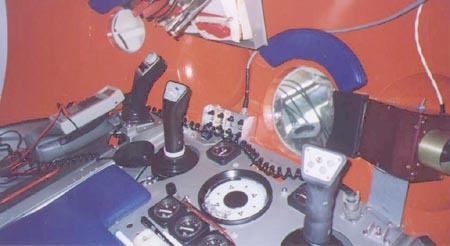 After notifying the control room on the Keldysh that MIR I had reached bottom and also determining the direction of the wreck site from our current position, the thrusters were again employed to propel us slowly forward. The bottom, which had initially appeared to be stark, began to reveal delicate coral formations as well as a number of small crab like creatures and starfish. Many stones were apparent, having fallen to these depths from melting icebergs that have passed above this spot for millions of years. Icebergs are created when large sections of ice break off glaciers… ice that has picked up many rocks as it slowly moved over the land on its way to the sea. Suddenly, a huge amount of ocean bottom loomed ahead. Anatoly maneuvered our craft to rise over the approaching hill in the bottom and, lo and behold… we came face to face with the knife-edge of the bow of the Titanic! 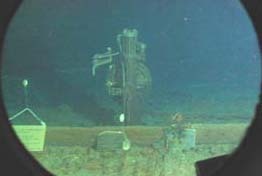 We slowly moved up the port side of the bow, past the huge anchor still firmly secured, and then up and over the foredeck, bumping into the Titanic’s main anchor crane in the process. I knew that this ship was the largest of her day, but at 883 feet long, 92.5 feet wide and 175 feet from her keep to the tops of her funnels, Titanic is still an extremely large vessel even by today’s standards. 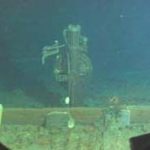 Of course today Titanic lies in two immense pieces. 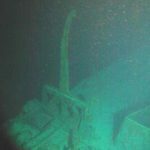 The bow section, which is about 400 feet long and, 2000 feet away, the 330 foot stern section. 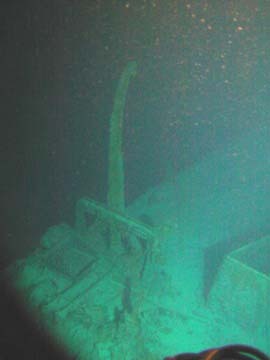 The missing 150 feet of the ship is scattered in a two square mile debris field surround the stern. Titanic’s Officer’s Quarters – 89 years later. Depth = 12,420 ft.
Before making our 2 1/2 hour ascent to the surface, we spent the next 5 hours exploring the two sections of the ship and the debris field, photographing as we went. MIR II, which had been launched one hour behind us, joined us with its lights and camera during this breath-taking period of exploration. The things we saw defy imagination and it was an experience that one never forgets.